Book by Mel Brooks and Thomas Meehan. Music by Mel Brooks. Directed by Shane Webb. Presented by Phoenix Ensemble. The Tin Shed Theatre, 1 – 23 February 2019. Shane Webb demonstrates outstanding directorial vision for this musical based on the 1974 Mel Brooks and Gene Wilder film of the same name. He’s clearly approaching it with great imagination and a lot of humour. While he’s able to effectively show the audience his ability to prepare a large cast and crew to deliver a well-paced, energetic show, Shane’s expectations for the outcome clearly surpass the abilities of many cast members. Some of the performers are obviously chosen for their singing ability over acting chops. Comedy is such a delicate artform, many people underestimate the level of acting skill needed to do a comedic line justice. Some performers rush their lines or emphasise the wrong words, so a few jokes that land really well in the movie are overlooked by the audience in this show. The most outstanding acting comes from Igor, played by David McLaughlin. David injects great gusto into playing the hunchback. He’s a shining star in this role. He has brilliant facial expressions and physicality and delivers his dialogue with lovely comic timing. Another stand-out performer is Harley Coghlan as Ziggy the village idiot. He magically gets your focus when he needs to, before seamlessly returning to the mass of the ensemble. He evidently has a talent for comedy, but also should be commended for his dancing skills. Hannah Crowther’s choreography is of a professional standard. It’s one of the most outstanding parts of the show. The entire cast execute their dances excellently. It’s even more impressive as The Tin Shed theatre is exactly as you’d imagine from the name – a big tin shed. It doesn’t feel airconditioned and the cast are often in layers of costuming. The audience has perspiration on top of perspiration, and we’re sitting still. So, it’s very impressive to see these performers handle the choreography without appearing to break a sweat. Unfortunately, Zach Price as Dr. Frederick Frankenstein seems reticent to throw himself 100% into the role. The resulting performance is in need of some more risk-taking and improved comic timing. 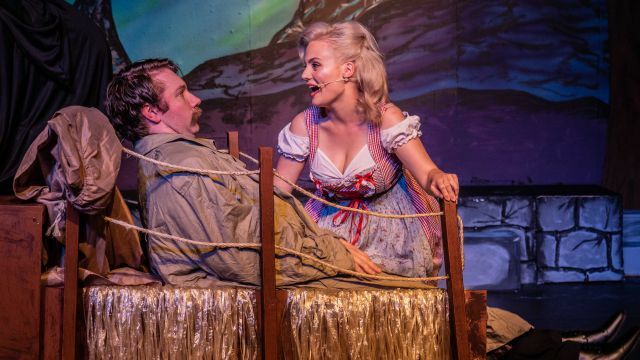 It lacks the unhinged, frayed stress and painfully supressed sexuality of Gene Wilder’s Frankenstein, which you’re naturally comparing Price’s work to throughout the entire show. While it’s wonderful to have a live band, there are too many flat notes to ignore from the brass and the singers. Those with perfect pitch find themselves twitching uncomfortably, but the majority of the audience don’t care at all. They love the songs, clapping along and fervently applauding every number. Justin Tubb-Hearne has made a lot out of a community theatre budget, with dozens of costume changes and a huge ensemble cast to clothe. His set design in collaboration with Shane Webb is very clever. The secret passages are especially good, as you don’t notice the doors until they’re used. 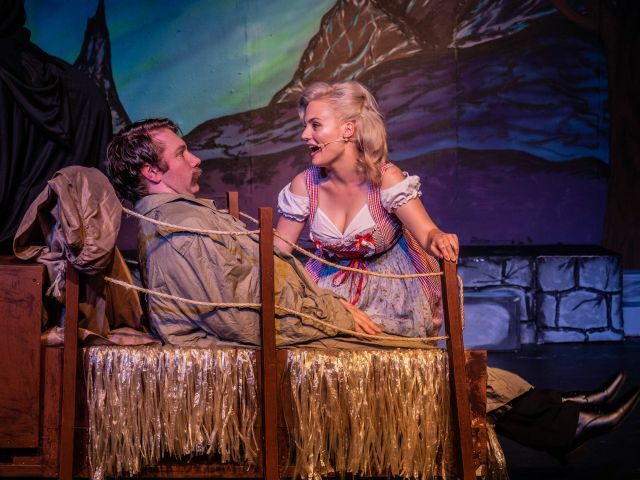 While some of the humour feels a little out of step with modern societal morals – Frau Blucher minimising domestic violence in song form for instance – there are still plenty of laugh-out-loud moments in Young Frankenstein. The show is a lot of fun, it’s energetic and has a ‘big budget musical’ vision behind its direction. Everyone is very well rehearsed, without a dry moment or a second of hesitation. The enthusiasm for their artform is palpable from the cast, crew, and even the front-of-house staff. This is upbeat musical theatre produced with a lot of passion.